This film (Vratné lahve – in Czech, 2007) is made by Jan Svěrák. The main role stars his father Zděnek Svěrák. It is the third movie in the trilogy on aging that commenced 1991 with The Elementary School and continued in 1996 with the Oscar-winning Kolya. On the DVD’s extras one can see how the famous family team is working plus some additional scenes, a gallery, the storyboard and comics. 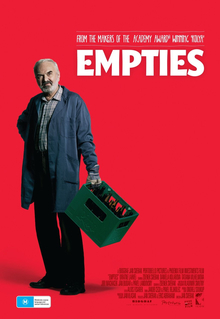 Empties is a moving Czech comedy – good for laughing and thinking over. Is an old, pardon, an elderly, person condemned to an empty life, without love and tenderness? This comic love story shows the opposite. We have just seen it for the second time. And enjoyed it as years ago. Each of us has his/her own favorite scene. Paul likes Josef trying to teach literature and me – the mysterious traces on the wall behind the counter. What exactly? Watch it :).